We like to work with the material in stainless steel grade. we produced high precision machine parts in all the grades for stainless steel like 303, 304,316. While machining this products we keep keen attention over deburring and specified tolerances. we are suppling this to exporters, Fasteners and hardwares. We are specialized inmanufacturingof Mild Steel Parts in designs. 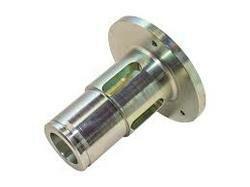 We have strong command in machining of this material as well as its variant grade like En series. While machining we keep our specified tolerance to achieve the final size easily. We work for high precision and accuracy. We aresupplythese parts to Electromechanical Industries, Fasteners, Automobile Industries, Electronic and Electrical fittings. Looking for Precision Turned Parts ?